With this setting, the GUID of the user is also written to the log file in the portal directory internal/statistics when application pages are accessed. Emphasizes, using a partial refresh (Ajax), changes to pages for a short time in yellow. 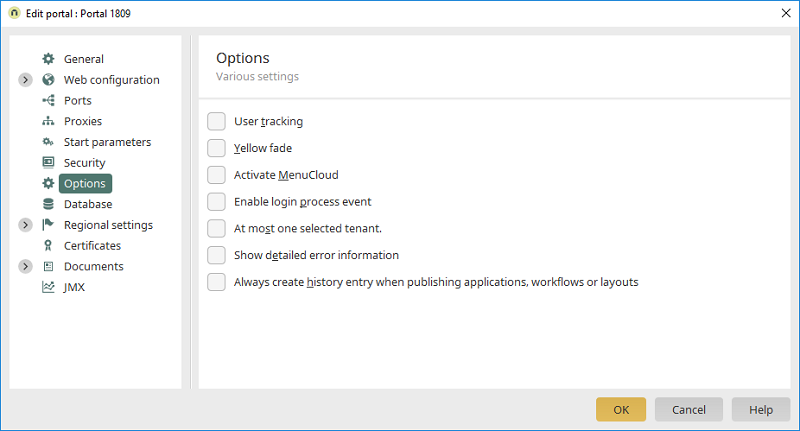 This setting determines if clicks on menu items will be logged in the MenuCloud portlet. In order to activate this setting, the portal layout needs to be published. This setting has the effect of sending the login of a user in the form of a server event, which can be evaluated in the Processes module with a Groovy event handler. With this option, a user can only select one tenant and therefore can therefore only see the data of this selected tenant. If errors occur on the server, this will be shown in the web. If this setting has been activated, additional error details will be provided. Means that a new entry is created in the history with every publication. This option makes sense, for example, for live systems so that changes in the portal can be tracked. Independent of this setting, all publishing options will be shown. When an action, which usually does not create a new history entry (e.g. Optimized publish), the user will receive a notification that a history entry is required. Following this, the dialog for creating a new entry will open. More information about this can be found here.